On Saturday 27 April 2019 from 14h00 to 18h00. L'association Nevers Libre organise une install party, le samedi 27 avril 2019 de 14h00 à 18h00 dans les locaux d'Access Code School à l'Inkub, au 7 bis, rue du 13ème de ligne 58000 Nevers. 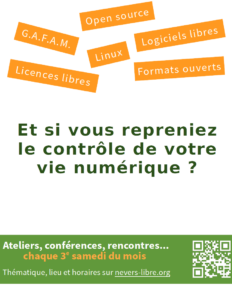 Au programme de cette demi-journée, venez découvrir le fonctionnement de GNU/Linux et de ses logiciels libres avec nos bénévoles. Nous vous aiderons à installer et configurer vos systèmes d'exploitation et logiciels libres pour une utilisation quotidienne. On Saturday 19 January 2019 from 14h00 to 19h00. On Tuesday 8 January 2019 from 20h30 to 23h30. On Tuesday 18 December 2018 from 20h00 to 23h30. On Tuesday 11 December 2018 from 20h30 to 23h30. On Tuesday 26 June 2018 from 20h30 to 23h30. On Tuesday 19 June 2018 from 20h30 to 23h30. On Tuesday 12 June 2018 from 20h30 to 23h30. On Wednesday 6 June 2018 from 18h30 to 20h30. On Tuesday 5 June 2018 from 20h30 to 23h30. On Tuesday 12 December 2017 from 20h30 to 23h30. On Tuesday 17 October 2017 from 20h30 to 23h30. On Tuesday 7 February 2017 from 20h30 to 23h00. On Saturday 1 October 2016 from 13h30 to 18h00. On Tuesday 24 May 2016 from 20h30 to 23h30. On Tuesday 17 May 2016 from 20h30 to 23h30. On Tuesday 10 May 2016 from 20h30 to 23h30. Dijon Conférence : Web, framework or not framework ? On Thursday 28 April 2016 from 17h30 to 20h00. On Monday 25 April 2016 from 18h00 to 20h00. On Saturday 9 April 2016 from 10h00 to 18h00. Savigny-lès-Beaune Journée "Demo & Install Party"
Savigny-lès-Beaune Conférence "Linux & les Logiciels Libres"
On Monday 21 March 2016 from 18h30 to 20h30. On Saturday 19 March 2016 from 14h00 to 20h00. On Saturday 19 March 2016 from 10h00 to 12h30. Dijon Journée de conférences : "Les pièces détachées"
On Tuesday 26 January 2016 from 20h30 to 23h30. On Tuesday 15 December 2015 from 20h30 to 23h30. On Tuesday 8 December 2015 from 20h30 to 23h30. From Tuesday 24 November 2015 at 14h00 to Thursday 26 November 2015 at 13h00. On Tuesday 13 October 2015 from 20h30 to 23h30. On Tuesday 29 September 2015 from 20h30 to 23h30. On Sunday 28 June 2015 from 14h00 to 18h00. On Tuesday 24 March 2015 from 18h00 to 19h50. On Tuesday 17 March 2015 from 17h30 to 19h00. Quetigny Pourquoi et comment êtes-vous passé au logiciel libre ? On Tuesday 21 October 2014 from 20h00 to 23h00. On Tuesday 14 October 2014 from 20h00 to 23h00. On Tuesday 2 September 2014 from 20h30 to 23h00. On Friday 29 August 2014 from 18h30 to 23h30. On Thursday 14 August 2014 from 18h30 to 23h30. Venarey-les-Laumes Journée Libre en fête : "Comment le faire soi-même ?" On Saturday 5 April 2014 from 09h45 to 19h30. On Saturday 22 March 2014 from 10h00 to 17h00. On Tuesday 18 February 2014 from 20h30 to 22h00. On Tuesday 21 January 2014 from 20h00 to 23h30. Dijon Présentation débat : Des logiciels qui vous veulent du bien !!! On Thursday 9 January 2014 from 20h00 to 21h30. On Tuesday 19 November 2013 from 20h30 to 23h30. On Friday 8 November 2013 from 18h30 to 23h30. On Sunday 2 June 2013 from 11h00 to 12h00. On Saturday 25 May 2013 from 10h00 to 12h00. On Saturday 6 April 2013 from 17h00 to 21h00. On Saturday 21 January 2012 from 14h00 to 17h00. On Saturday 15 October 2011 from 14h00 to 17h00. On Saturday 18 June 2011 from 14h00 to 17h00. On Saturday 21 May 2011 from 14h00 to 17h00. On Saturday 19 February 2011 from 14h00 to 17h00. On Saturday 15 January 2011 from 14h00 to 17h00. On Saturday 18 December 2010 from 14h00 to 17h00. On Saturday 20 November 2010 from 13h00 to 17h00. On Saturday 16 October 2010 from 14h00 to 17h00. On Saturday 18 September 2010 from 14h00 to 17h00. On Saturday 19 June 2010 from 14h00 to 17h00. On Friday 19 March 2010 from 20h00 to 22h45. On Friday 26 February 2010 from 19h30 to 23h00. On Saturday 20 February 2010 from 14h00 to 17h00. On Friday 29 January 2010 from 19h30 to 23h00. On Saturday 16 January 2010 from 14h00 to 17h00. On Friday 8 January 2010 from 19h30 to 22h30. On Saturday 19 December 2009 from 14h00 to 17h00. On Saturday 17 October 2009 from 14h00 to 17h00.